Sports heads on ice! Grab a stick, and send the puck flying past the other head into the net. 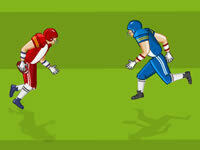 You need to pass the ball to every player to complete the level. Perform dinks, lobs, huge passes and spectacular overhead volleys. Your objective in this soccer skills pepsi game is to kick the ball from roof to roof. Can you score over 4000 and call yourself a playa? Pot the balls before they explode, and avoid the dynamite! A 2008 version of one of the web's most famous and popular games. Make it to the end zone before the opposing team takes you down! You'll need some serious skills (or a miracle) to score the winning touchdown! Swim against your opponents and beat their time to become world champion. Fast and fluid gameplay with realistic court surfaces and a huge range of unique player styles and characteristics. With just a simple click and flick of the mouse you’ll soon be thumping crosscourt winners, yet at the core of Stick Tennis is a highly sophisticated physics engine that rewards tactical play. Easy to play yet difficult to master. The World Cup has brought the dead back to the pitch - can you work your way through all 7 matches to lift the Zombie World Cup? You've got some challenges to complete in your Baseball game. Hit home-runs, specific sections of the field and even the pitcher himself. Very fun Billiard, 9 Ball with 40 level missions. Free style playing available. There is shop in which you can buy cue, chalk and bonus life for free. Local machine saving available. Mochi highscore available too.